We are all busy and sometimes, it’s simply hard to come up with new ideas to engage and keep our tiny toddlers busy. 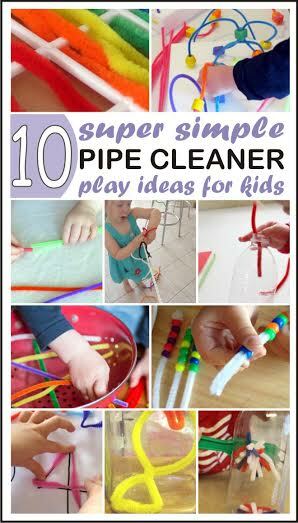 We compiled a list of 10 super simple activities with pipe cleaners you can easily set up in just few minutes and let your kids enjoy the play while you attend other tasks in your home. The simplest possible activity we could find was to use a string and hang pipe cleaners on it. It sounds so simple and yet, kids love it! Cut few straws and use pipe cleaners to make bracelets. An easy way to work on fine motor skills! You can also use pipe cleaners to teach kids about colors. Very easy and fast to set up! If you have a colander, you can let kids practice their fine motor skills by pushing pipe cleaners through the holes. Another way to work little fingers is to weave pipe cleaners. Math and number recognition are fun with pipe cleaners as children can use them for number formation. With some beads, you can set child to learn patterns with pipe cleaners. Or turn them into a fun and cheap maze! Twist pipe cleaners into fish shapes for an easy fishing game your kids will enjoy! Teach them about magnetism with this simple magnet play. Mihaela runs Best Toys 4 Toddlers blog and loves to come up with new ideas how to use old toys her 2 daughters keep leaving on the floor to slip over. She loves them despite the fact that they call her mommy few hundred times a day, and it makes her nuts. Right now she’s thinking how to get her 7 year old to make toys for the 2 year old as an idea to bring them closer together. In the mean time, you can find her on Facebook, Twitter and Pinterest sharing playful learning ideas for toddlers and preschoolers.